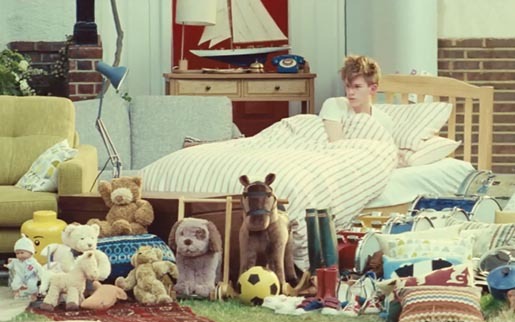 John Lewis has launched “Things Matter”, a TV advert for home insurance centring on the emotional side of insuring the things that matter in the home. The campaign uses stop-frame animation to follow the story of the entire contents of a family’s house coming to life in ways that reflect their personality and character. They make their way of the house and assembly on the lawn for a family photograph. The campaign includes a “What Matters” microsite with behind the scenes footage and a Vine short video competition to be launched on August 19. The Things Matter campaign was developed at adam&eveDDB, London, by executive creative directors Ben Priest, Ben Tollett and Emer Stamp, creatives Simon Lloyd, Christine Turner, Rory Hall and Steph Ellis, agency producer Sophie Smith, working with John Lewis marketing manager Craig Inglis. Filming was shot by director Dougal Wilson via Blink Productions. Animation was produced at Clapham Road Studios by producer Ewen Brown and production manager Josh Smith. Editor was Joe Guest at Final Cut. Post production was done at MPC by VFX supervisor Tom Harding. Sound was produced at Factory Studios by Anthony Moore. Music was produced at Finger Music. The soundtrack is a cover of the Fleetwood Mac song, Don’t Stop Thinking About Tomorrow, re-recorded by Nina Nesbitt.